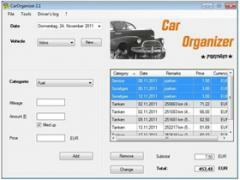 CarOrganizer is a handy piece of software that bundles a collection of useful tools to keep track of mileage, expenses and fuel consumptions of your vehicles. You can create multiple car profiles and you will need to fill in details regarding cost, mileage and the date of the refuel. The application shows the information organized as a table, and it can calculate the average value of liters per 100 km, best consumption and worst consumption. You can change the measuring system to miles and gallons, as well as select the currency for evaluating costs. Furthermore, CarOrganizer will calculate the median, total and average gas requirement and these statistics can be visualized as a pie chart or bar graph. It is possible to export the records as an image or CSV file.